Market trends The activities of the Poste Italiane Group set within the Italian macro-economic context.ctivities of the Poste Italiane Group set within the Italian macro-economic context. The Italian macroeconomic trends illustrated will continue to create opportunities for Poste. 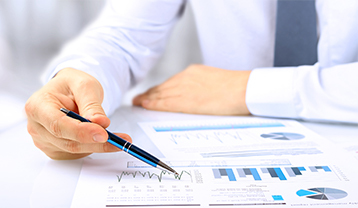 Italian GDP has shown steady growth which is expected to continue over the plan horizon. Italian households are among the wealthiest in Europe with financial assets twice the size of GDP. They also have the LOWEST ratio of debt to GDP at a family level. At the same time, Italy is one of the least developed markets in Europe in terms of non-motor P&C insurance cover. These are clear opportunities for us and the plan is based on credible targets aimed at minimizing execution risk. We are already a leading player in e-commerce. The growing B2C parcel market will continue to be a significant driver for us in the coming years. From a low base of two parcels per capita per year, Italy is expected to see around a 25% annual growth in B2C volumes by 2020. If this trend continues, Italy will get much closer to the European average of 8 to 10 items per year which basically means more than doubling current volumes. Poste Italiane is already the market leader with a 30% market share today. 1 in 3 parcels are delivered by Poste Italiane in the eCommerce space. There is a similar trend in digital space, where Poste has clear leadership in a fast-growing market. Two of Poste’s apps – Postepay and BancoPosta - are the Number 1 and Number 2 financial apps in Italy. In total - our apps have been downloaded more than 15 million times and we have over 15 million registered website users, a number that has increased 20 percent in the past year. 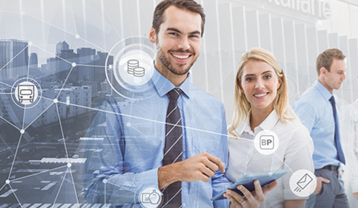 Customer engagement is key in the evolution of digital payments and financial services. Our digital presence will be fully integrated with our unique physical network. It is not a question of one replacing the other. 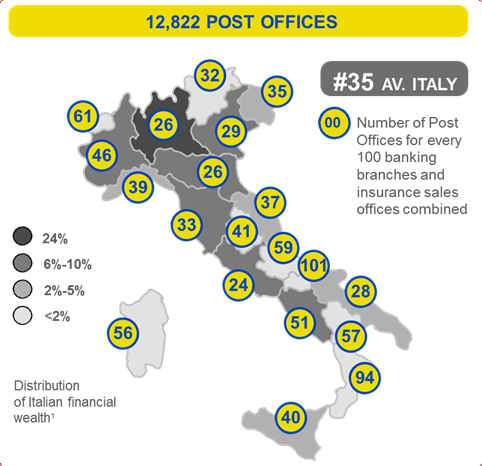 When you add together banking branches and insurance agencies all around Italy, Poste has 35 branches for every 100 bankassurance outlet. and telecommunication services (sim cards and landlines). We are strengthening the link between our physical postal offices - trusted partners in every Italian community – and our digital spaces. And our post offices will adapt to ensure all customers can benefit from our complete product offering – digital and traditional.